Confectionique: Is this really happening? Oui! Is this really happening? Oui! Sunday afternoon. Sunlight was streaming in the large windows as our market filled with customers shopping for that perfect something when suddenly, a woman and a man with a guitar case entered the shop. The lady with the infectious smile and twinkle in her eye asked-"Can my friend play his guitar in your shop while I browse?" She continued, "He can sing Jacques Brel," she winked and smiled again. We paused, looked at each other for a moment and then quickly found a chair and space for guitar playing. Monsieur introduced himself as David. But in his French vernacular it's an even more beautiful ..."Dah-veed"....feel how that rolls off your tongue? He quickly opened his guitar case and pulled out the most beautiful, shiny guitar and began to play. 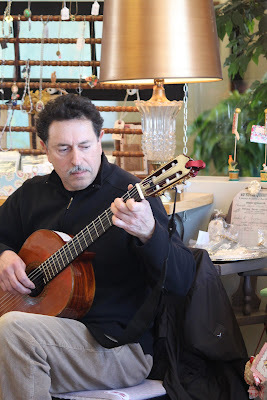 His fingers began to strum effortlessly and gracefully across the strings as he played flamenco and classical acoustic tunes that he composed. Already feeling at home, he smiled, nodded at all of us, joked with the little ones and played and played and played. The customers browsed through the market pausing to listen and, like us, soaking in this amazing serendipitous event. Then, David looked at all of us smiled and asked,"You like French music?" In a trance we nodded our heads simultaneously, "Oui," we said. He continued, "Then, I will play my last two songs from Jacques Brel." 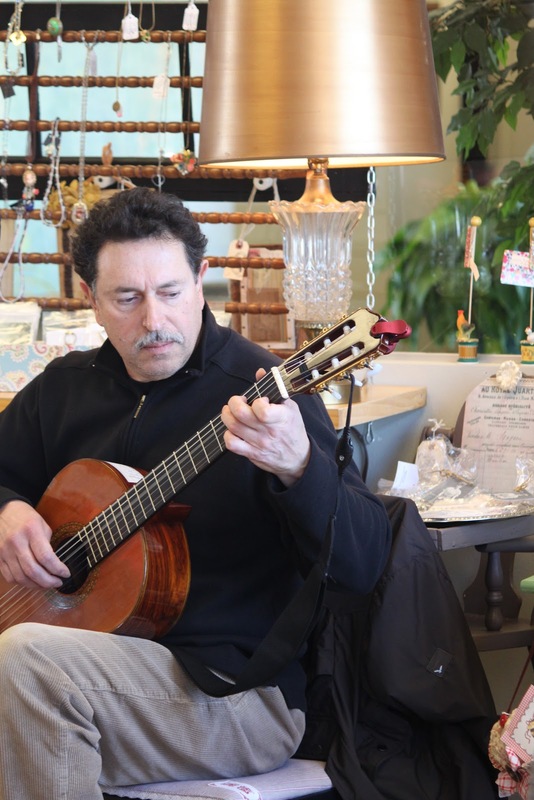 He began to strum and then he began to sing in French in a warm, confident tone. We all stopped, sat and listened. We have heard the words before by Jacques Brel, but never in such an intimate way. What a meaningful gift to us by a man who was willing to sit and share his love of music with all of us. This was an experience so spontaneous,so Confectionique, so Paris. A special Merci to David and Mary for such a special gift! We hope to see you soon!